This post is only intended to provide information on what a postprocessor is. As part of this course, we will not be involved in the creation of post-processors. I just want to show what the postprocessor looks like in Alphacam and how it is built. 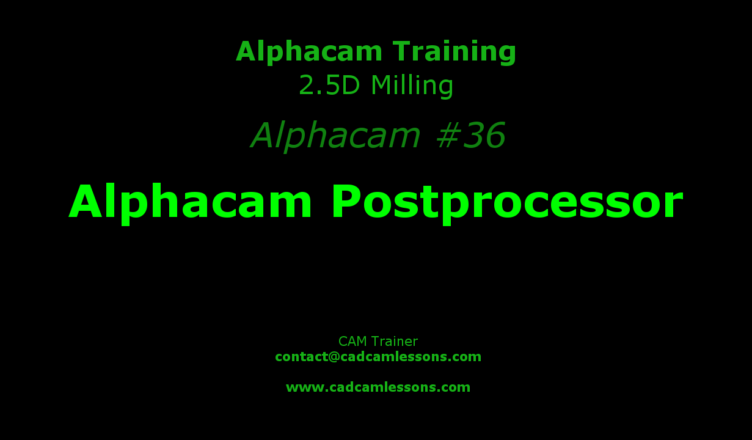 By default, for the Alphacam Router version, the postprocessors are located in the folder C:\Alphacam\LICOMDAT\RPosts.Alp. The following figure shows a fragment of the postprocessor that we used to generate a machining program. This is a series of instructions that tell you what to appear in the machining program and in what format. When generating the NC code, Alphacam goes through the postprocessor’s instructions and generates the corresponding code one by one. What is in square brackets are Alphacam’s variables and they are read from the generated tool path. What stands in front of square brackets is plain text that will be generated in the NC code as it is written in the postprocessor. Writing a postprocessor consists in the appropriate linking of the text, which we write rigidly with the relevant postprocessor variables. This should be done so that the structure of the NC code corresponds to the selected control system. For example, for Haas and Heidenhain, the postprocessor variables from the square brackets will be the same, but we already need to know what to put in front of the brackets. So not only that we need to know what these variables correspond to, then we still need to know the programming structure for a specific controller quite well, as well as the general principles of programming CNC machine. Writing a postprocessor is not an easy task and it’s easy to make a mistake, but you can learn it. 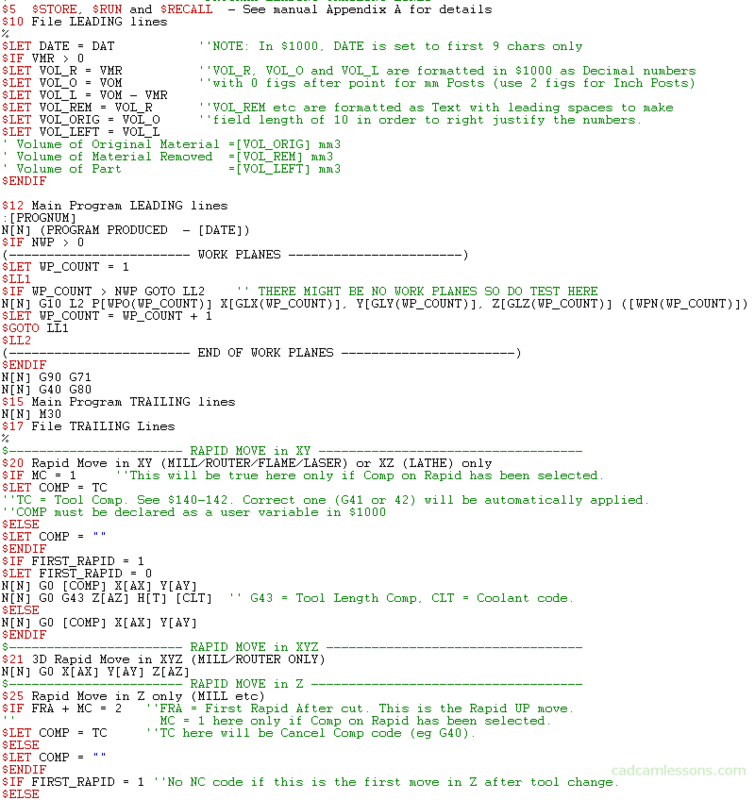 If we know the NC code of the controller well, we can write a postprocessor that will generate the correct code or at least close to the correct code. This approach is not bad in the case of hobby machines (where the cost of the postprocessor can be quite large compared to the price of the machine) and in the case where we use the CAM system rarely, and most programs are written from the machine’s desktop. Then we generate the most similar NC code and edit it manually. Of course, in case cheap, amateur or semi-professional CAM systems. In the case of professional machines and professional CAM systems, the cost of the postprocessor is only a small part of the price of the whole set. And here, in a production environment, we can not afford to manually adjust the NC code every time. We also need to eliminate places where errors can occur. Therefore, by focusing on programming CNC machines from the CAM systems, while planning the budget for this purpose, let’s also take into account the professional implementation of the postprocessor.